On August 28th, Heritage Auctions sold the 1921 Uniform Player's Contract between the Acme Packers Football Club and Arthur Schmaehl, the Packers' starting halfback, for $10,157.50. The contract is a remarkable relic from the Packers inaugural season in the American Professional Football Association, the precursor to the National Football League. Arthur Schmaehl began playing for the Acme Packers in 1919 at the age of 25. The 148-lb fullback graduated from sandlot football, playing neither in high school nor college prior to joining the Packers. Schmaehl scored the Packers' first touchdown in the team's first game as a member of the APFA, a 7-6 loss to the Minneapolis Marines. At some point during the 1921 season, Schmaehl suffered an injury to his nose and was pictured with a bandage in the Packers team photo. 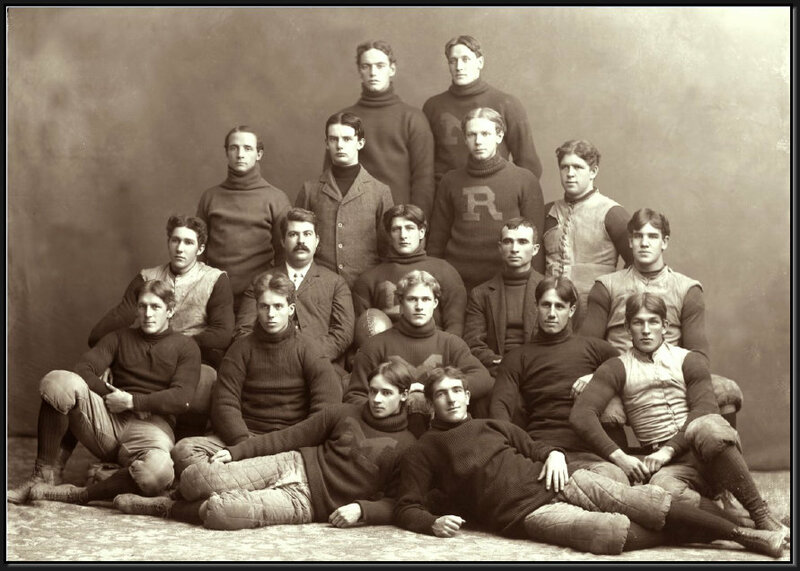 He was also the only player holding a football helmet in the photo, an executioner style head harness designed to protect his injury. Schmaehl did not return to the Packers in 1922, instead signing with the semi-professional Detroit Maroons, where he played for two seasons before retiring from football. In addition to being an incredibly rare NFL and Packers artifact, the Heritage Auction Uniform Player's Contract illustrates the strategies employed by the APFA to bring respectability to the game and eventually transform professional football into America's most popular pastime. The key elements include strict conduct rules over which the APFA was the sole arbiter, giving each team exclusive rights to players to prevent ringers and team jumping, and put team owners in the driver's seat in salary negotiations. The later abuse of many of these tenets would lead to the formation of the National Football League Players Association to arbitrate on behalf of players in 1956. Prior to the 1920's, American professional football leagues were primarily loose regional associations with revolving doors for teams and for players, who were often treated and viewed as mercenaries rendering services to the highest bidder. Relying almost entirely on weekly gate receipts, teams often blurred ethical lines to win and increase attendance. Nowhere was this problem more acute than in the Ohio League, one of the most competitive league in the country. 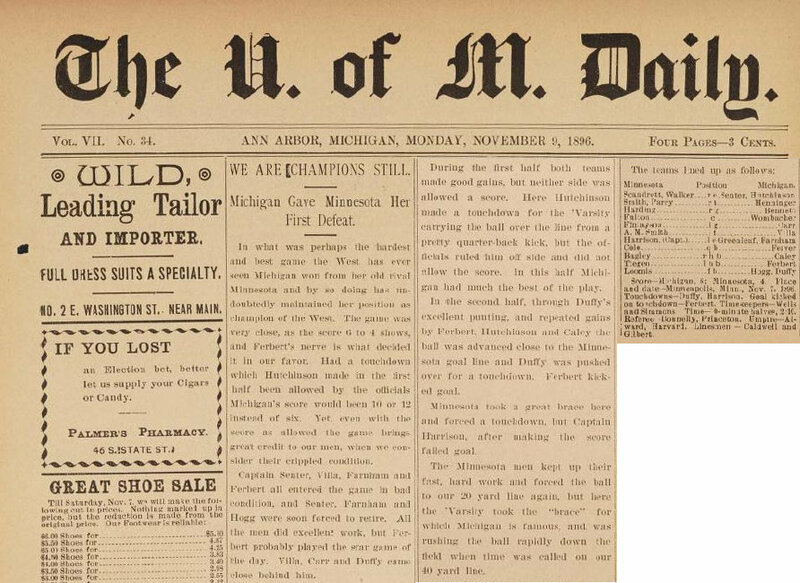 Marred by a game-fixing scandal beween the Canton Bulldogs and Massillon Tigers in 1906, the league struggled for relevance throughout the 1910's. In 1915, Jack Cusack, Canton's new manager, signed Jim Thorpe, recognized as the world's greatest athlete, to coach and play for the Bulldogs. Thorpe led the Bulldogs to four consecutive Ohio League Championships, but more importantly drew huge crowds and reignited interest in professional football. On August 20, 1920, four members of the Ohio League, the Akron Pros, Canton Bulldogs, Cleveland Indians, Rock Island Islanders and Dayton Triangles, met in a Canton, Ohio automobile showroom to discuss the upcoming season and the future of the league. The result was the formation of the American Professional Football Conference, which was renamed the American Professional Football Association (APFA) at an expanded meeting which included 14 teams from 4 states the following month. The members unanimously selected Jim Thorpe as the leagues first president. The APFA's goal was to become the preeminent national professional football league by cleaning up its image with the American public, regulating player participation, enforcing rules of conduct, and controlling skyrocketing player salaries through salary caps. The Akron Pros, claimed the 1920 APFA championship as the lone undefeated team. The APFA was renamed the National Football League in 1922. On August 11, 1919, in the Green Bay Press-Gazette building, a group of former players established the semi-professional football team that would eventually become the Green Bay Packers. The players elected 21-year old former Notre Dame halfback Earl (Curly) Lambeau captain. Lambeau had recently dropped out of Notre Dame, where he played for legendary coach Knute Rockne in his first season with the Fighting Irish. Lambeau talked his employer, the Indian Packing Company, into sponsoring the team, which took on the nickname "Packers." The meat packing company agreed to provide Lambeau with $500 to purchase uniforms and allowed the team to use its property for practice in exchange for marketing its name. In 1921, the Acme Packing Company purchased the Indian Packing Company, and the team was briefly known as the Acme Packers. In September 1921, the American Professional Football Association awarded a franchise to the Acme Packers, which competed as one of 21 APFA teams that year. 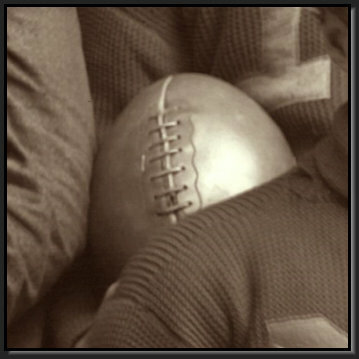 The end of the 1921 season was marred by controversy after three Notre Dame players were caught playing for the Packers under assumed names. The Acme Packing Company dropped its sponsorship of the team. Lambeau and a group of Green Bay businessmen negotiated a reinstatement of the Packers franchise with the APFA for $50, and the team was renamed the Green Bay Football Club. 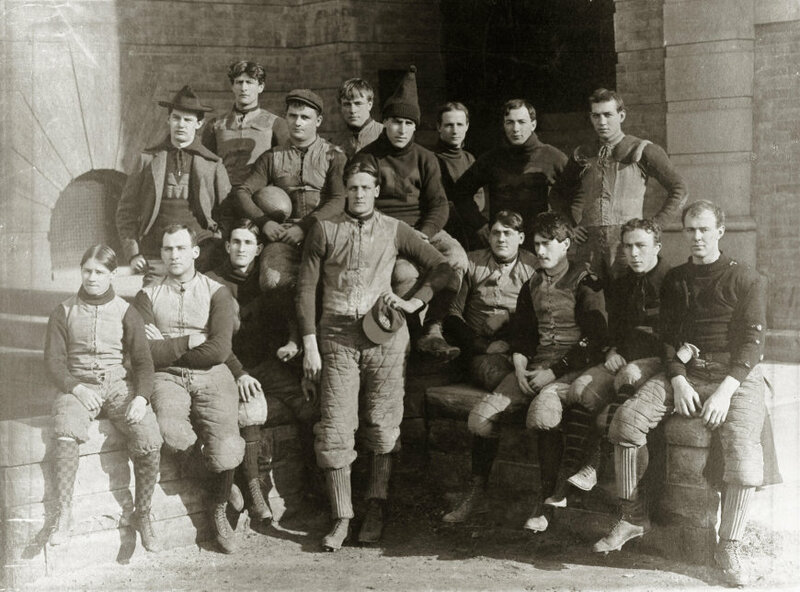 The Packers' team photo may be the earliest known image of an executioner-style football helmet. Previously thought to have been introduced in the mid-1920's, the image proves that the style was actually available in 1921. In 1919, Goldsmith sold the No. 64 head harness, a helmet with molded side and ear extensions covering the ears, temples, and back of the head and white felt padding. By 1925, the No. 64 was Goldsmith's linesman helmet which included a patented foam rubber cushion ring in the crown. The lone surviving example of this Goldsmith model has felt padding and no rubber ring. Therefore, we speculate that this example is a first generation No. 64, introduced by Goldsmith in 1920 or 1921, and the first executioner helmet offered by any sporting goods manufacturer. In dire financial straights at the end of 1922, the team's owners turned to the Green Bay business community for assistance. The result was the formation of the non-profit Green Bay Football Corporation, the first and only community-owned football franchise in the history of the NFL.